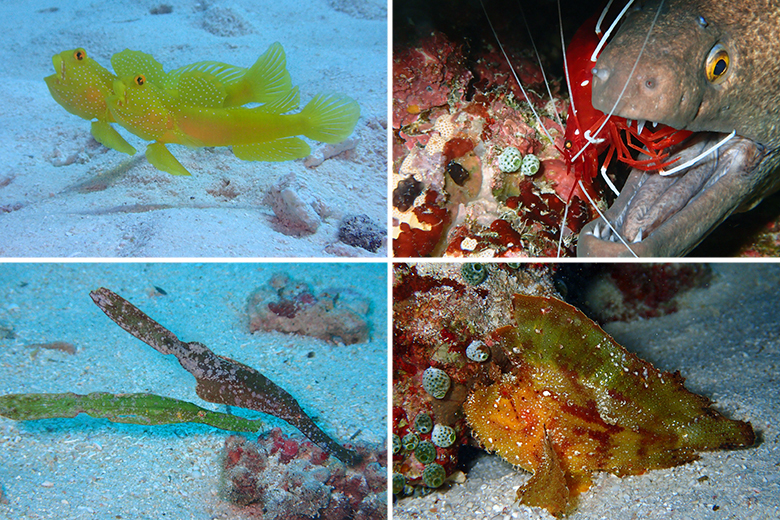 【１】Macro sea life diving・・・ You will find many small (macro) sea life such as goby, nudibranch, shrimp, etc. There are around 20 dive points that we cover on regular basis. 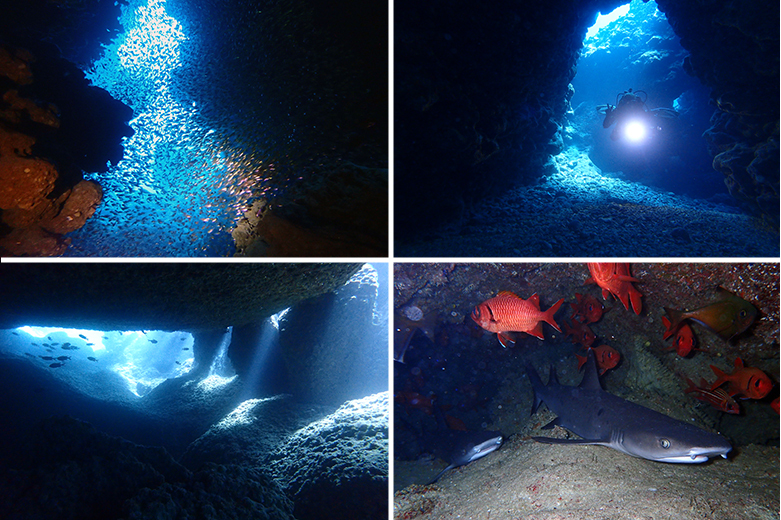 【２】Seascape・・・ Lots of arches, canyons, swim throughs and coral reef. 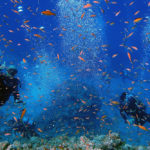 You will enjoy the beautiful underwater scenery as well as sea life living there. 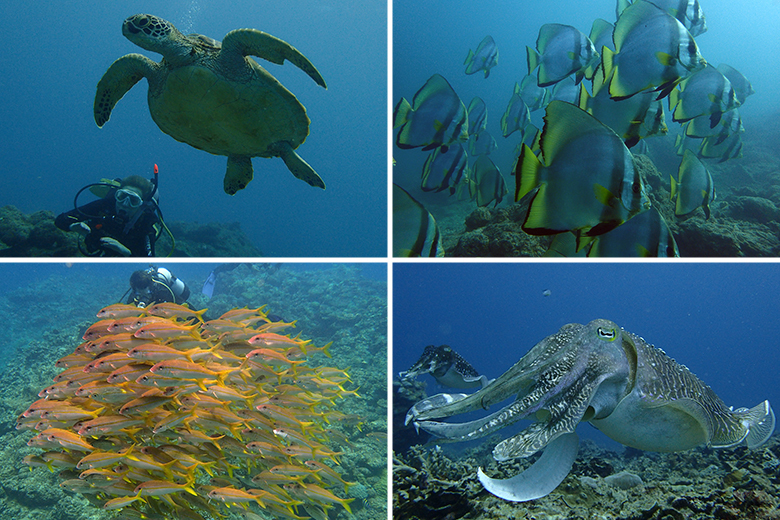 There are around 10 locations that we dive for seascape on regular basis. 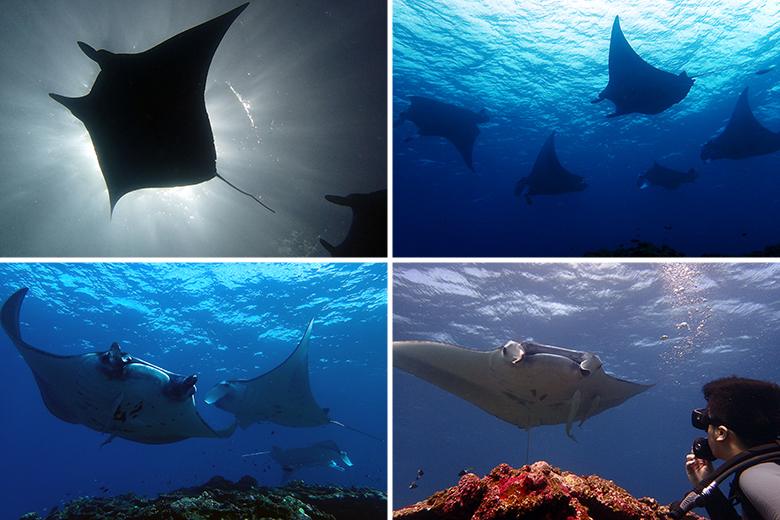 【３】 Manta points・・・The main objective of the dives will be to watch mantas. Mantas are not always there, but Ishigaki and surrounding islands of Yaeyama boasts high encounter rate of mantas. One of the most famous ones are Manta Scramble and Manta City, located in Kabira area. 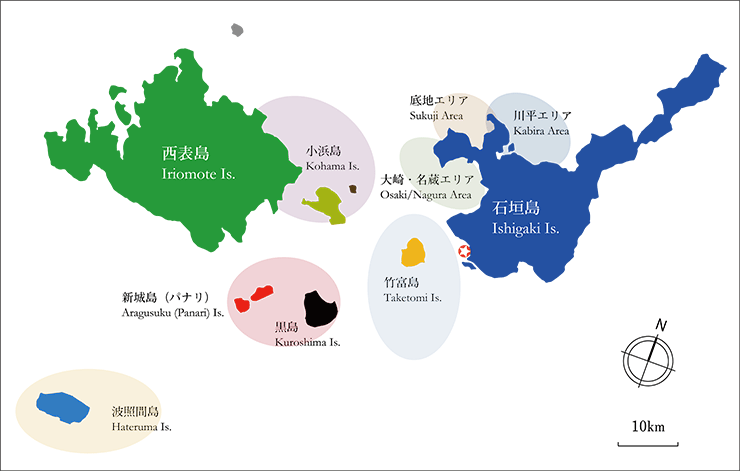 We have other areas, such as Kuroshima, Panari and Iriomote. There are total of five manta points we visit on regular basis. In terms of sea life you can see, more than half of the dive points are for small macro sea life. 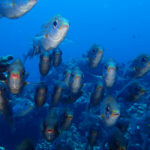 But even those macro dive points some bigger entertainers such as turtles, Longfin Batfish, Giant cuttlefish and others. There are a few dive points where you can see big ones such as Dogtooth tuna or Barracuda, depending on the tide. Please ask our staffs for more details. With our 60ft diving cruiser Blue Swan, we cover wide area of Ishigaki and Yaeyama islands. We cover approximately 35 dive points on regular basis. Dive points each day are decided every morning based on the sea condition as well as our guests’ requests, and try to take our guests to different dive points for every dive. ※Trip to Hateruma island takes place couple of times a year (particularly in summer) when the condition is calm, as special trips (additional fuel charge required). Except for the first day of Open Water Diver program, all our services will be boat dives on Blue Swan. Usually there is no current (only mild one if any), and will anchor our boat at each dive point. You will enter into water from the back of the boat, dive around the boat, come back and have 5min safety stop under the boat before you surface. There is only one drift diving point, and this will be available for advanced divers only. Average depth around Ishigaki and Yaeyama islands is 12-14m. Usually there is no current (only mild current if any), and most of the diving points are appropriate for all level of divers.